Artisan Mark Witzling's contemporary abstract paintings tell a different story for each person who sees them. 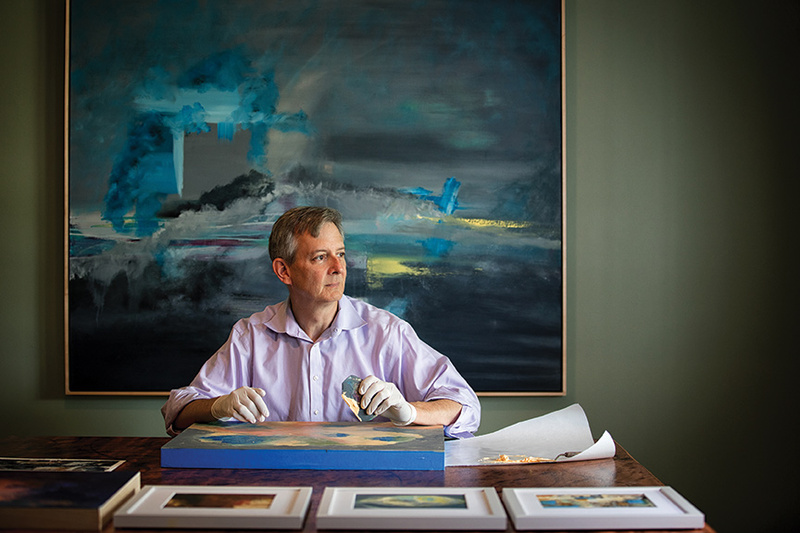 Each one of Mark Witzling’s oil and cold wax paintings tells a story. But the story is different for everyone who gazes at it. Where some see nature, others see religion. Or a still life. Or a figure. This is the beauty, and the challenge, of contemporary abstract painting. As Witzling says, “with abstracts, you remove the literal constraints. You’re not grading it against another image.” Instead, his work explores color, shapes and lines that are juxtapositions of intricacy and simplicity. The hardest part of painting, Witzling says, is knowing when a piece is finished. So how does he know? “When the viewer can see a complexity of layers, but feel the unity of a piece, that’s when it’s done,” Witzling explains. Witzling’s paintings will be available for sale at the Midwest Salute to the Arts, August 25-27, at Moody Park in Fairview Heights. For more information, visit his website or instagram.